Originally installed in 2008, the green roof atop the Math and Science Center was revitalized this past spring. Photo by Rebecca Park. Produce grown on the new green roof at Emory University Hospital Midtown is served in the hospital cafeteria. The green roof on Facilities and Maintenance Building B offers the chance to evaluate three green roof systems. Thomas, Hopkins and Smith halls — known together as the Complex — feature planting trays on their connecting rooftops. Photo by Tina Chang. The green roof on Longstreet-Means Hall began with "volunteers," native species whose spores and seeds simply landed there. Photo by Tina Chang. 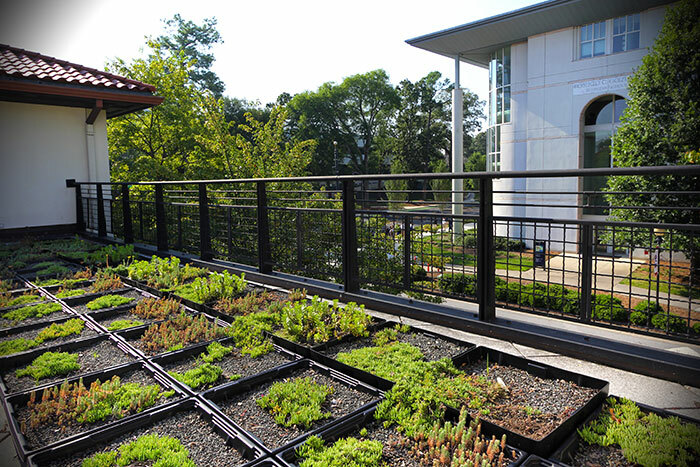 From campus buildings to pedestrian plazas and now, a vegetable garden atop a university hospital, green roofs are serving Emory’s sustainability vision. Last fall, Emory senior Rebecca Park looked across a sprawling field of shallow plastic trays carpeting a flat, open-air swath of rooftop on the Math and Science Center and saw real estate ripe for rebirth. 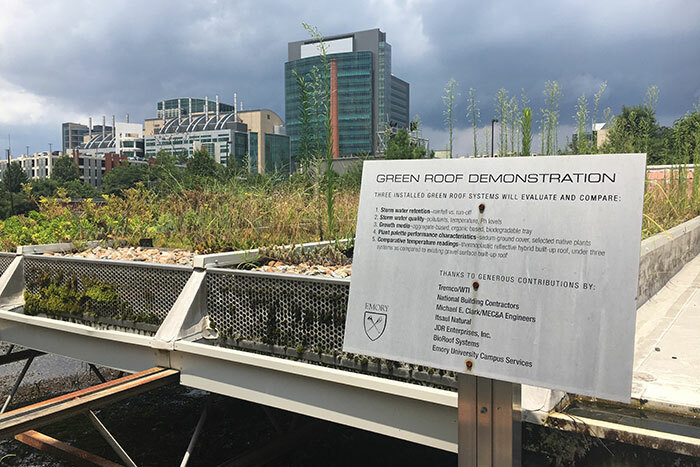 Originally installed in October 2008, the project was part of a student-led pilot study exploring the benefits of green roofs — vegetative roof coverings used in place of tiles or shingles to help disperse summer heat and absorb stormwater run-off. But almost a decade later, the low-maintenance project had seen better days. Drought cycles had taken a toll on the succulent plants, which appeared patchy and struggling. That semester, while taking an “Ecology of Emory” course with environmental sciences senior lecturer John Wegner, she heard the rooftop project described as “something that had kind of fallen by the wayside,” recalls Park, an environmental sciences major who graduated this year and now works with Trees Atlanta. With a budding interest in green infrastructure — the use of natural resources and processes to mitigate environmental challenges — Park was intrigued. “I saw an opportunity to learn more about green roofs and to revive an underutilized resource,” she explains. Buoyed by a Sustainability Incentives Fund grant through Emory’s Office of Sustainability Initiatives (OSI), Park led an effort this past spring to revitalize the project. 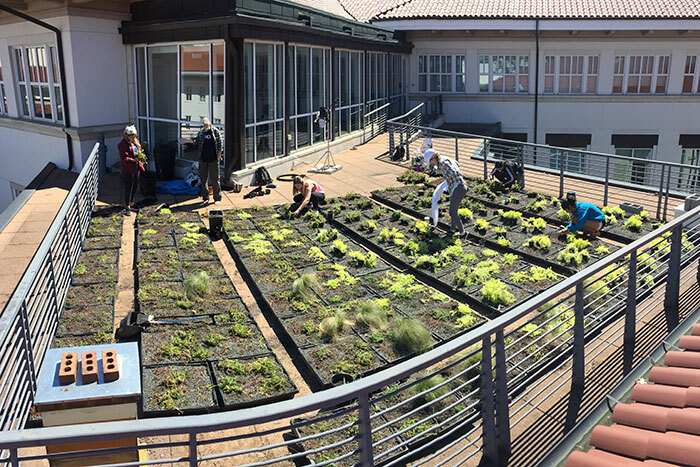 Today, visitors stepping off the elevator on the fifth floor of the Math and Science Center overlook more than 500 new plants, primarily specimens of drought-tolerant sedum and delosperma, in trays covering 420 square feet of the flat rooftop, just outside. Soon-to-be-installed educational signage will help publicize the plants’ role in helping create a cooler rooftop environment, reduce Emory’s contribution to Atlanta’s urban heat island, and stem downstream erosion in nearby creeks that can accompany heavy stormwater run-off. The revitalized Math and Science Center green roof is part of a growing trend on Emory properties — pockets of dedicated green space, often tucked away high and unseen, that serve a greater purpose. From residence halls and campus maintenance buildings to pedestrian plazas and now, a vegetable garden atop a university hospital, green roofs have found a welcome and functional home within Emory’s sustainability goals. Across campus, on an open-air plaza that stretches between the uppermost floors of Hopkins and Thomas residence halls, a light breeze skims over plants and new patio furniture that invites students to linger. Between Hopkins and Smith halls sits a twin veranda that also boasts outdoor furniture, lights, water and electrical outlets intended to encourage leisure or study, says Jonathan Cooper, director of Emory’s housing facilities and operations. Spearheaded by then-Emory biology student Caroline Plott 15C, in partnership with Emory housing operations and residence life staff, the green roof was established in 2015 through an OSI Sustainability Incentives Fund grant. Within big cities and urban spaces, green roofs are hardly a new idea, says Taylor Spicer, OSI sustainability programs coordinator. In 2003, the city of Atlanta piloted a 3,000-square-foot green roof on the fifth floor of City Hall, and cities across the nation have embraced versions of eco-roofs, a concept that stretches back to ancient Mesopotamia. “As the conversation about climate change has grown, we’re beginning to hear more about green roofs,” Spicer says. “It really is a mitigation tool, a way to make sure we employ our knowledge about natural systems and use them in our campus spaces to benefit ourselves and our environment." Green roofs offer many advantages, she notes. Rainfall that hits plants, porous pebbles and soil tends to linger, reducing runoff. The plants also help mitigate solar heat that bounces off rooftop surfaces and assist resident bee populations, providing “a small way to give pollinators a little pit stop,” Spicer says. Over at Longstreet-Means Hall, a stand of leggy greenery shimmers on a flat ledge just outside an eastern wall of third-floor windows. On the other side of the building, a narrow bed of plants has also found a home. Many of the plants are volunteers, native species whose spores and seeds simply landed there. “We choose to let it grow naturally and untended,” Cooper explains. 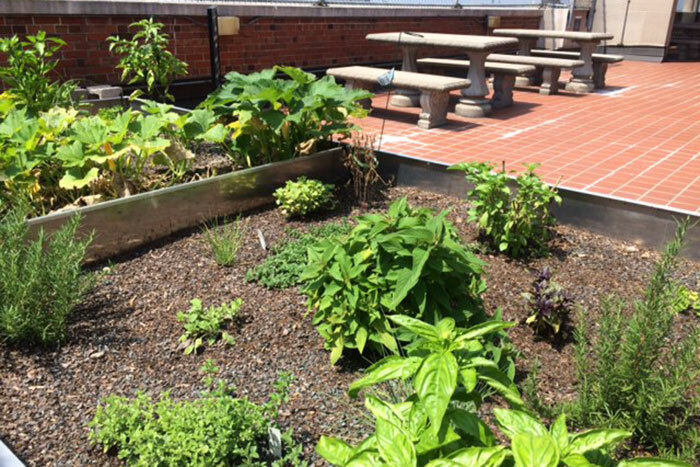 High atop Emory University Hospital Midtown’s (EUHM) Woodruff Building, a rooftop garden is thriving this summer, providing fresh herbs and produce for the hospital cafeteria. Twice a day, sprinklers are programmed to water the raised beds, now lush and overflowing with tomatoes, cucumbers, zucchini, peppers, squash and nearly a dozen different herbs, all planted only a few months ago. The idea behind the plot, which shares space with concrete picnic tables outside the Woodruff building’s 8th floor public safety offices, was to provide fresh, locally grown organic produce to patients, their families and hospital staff. Much of this season’s bounty has already found its way to the cafeteria salad bar, she says. 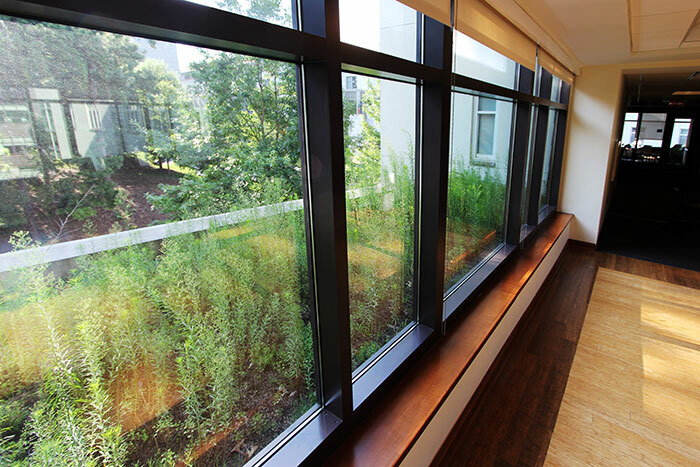 With sweeping skyline views, the veranda also provides a pleasant — and now, greener — respite for hospital employees, Creech adds. Across campus, green roofs are pulling double duty, offering cooling environmental benefits as well as enjoyable places for students and staff to gather. On a recent morning, Wegner stood atop the Math and Science Center green roof aiming an infrared temperature gun at a nearby rooftop. By 10:30 a.m., the iconic red tile roof was 123 degrees. By comparison, the green roof plant trays measured 20 to 30 degrees cooler. That’s fairly typical, says Wegner, who will teach a class this fall in biophilic and green design. Back in 2008, as the green roof was installed at the Math and Science Center, an experimental demonstration plot was also being created on a flat roof atop Emory’s Facilities and Maintenance Building B. Nearly a decade later — aided by recent summer rains — the plot is thriving. Tucked along a walkway between two buildings, long planting trays contain slightly different bedding media for scientific comparisons. The walkway between Rollins Research Center and Rollins School of Public Health, which covers a below-ground passageway connecting buildings and classrooms in the Rollins complex. Park sees something hopeful in the fact that green roofs are now being seen as a viable, functional option, at Emory and beyond.